Like a painter seeing the finality of expressionist language within yet to be applied paints, the title of Erica Dawson’s long poem, When Rap Spoke Straight to God, pushes and pulls to expand a reader’s sense of language before the poet has written her first line. Such is the power of six simple words carefully placed to open this 46-page poem. us in a minute, rap spoke straight to God. “When I broke bread, it was a syrup sandwich. scar. I can go a week and not touch it. This is where the reader starts chanting beneath her breath. This is where the reader squeezes the book’s spine like any good mystery, and presses on. This is where the reader begins to see the dirt, begins to smell the mist in the air, and inhales. This is why this poem—all 46 pages of it—is worth deep-reading and reading again. This is why poets are poets. Long poems, while not the expected norm, are not rare by any estimation. Other poets have pushed the weeds from the path before Erica Dawson. Think Philip Shultz’s, The Wherewithal, at 178 pages, represented by Schultz as “a novel in verse,” or even Claudia Rankine’s acclaimed book, Citizen, which uses a method akin to cinema verité to create a dimensionality and a continuous though moving focus. Dawson’s work shares a commonality with Rankin’s Citizen, in that both books bring forward the concept that people—every person, regardless of race or gender—shares an innate curiosity into the living of others’ lives. We all want to know something of every other person’s nitty-gritty everyday struggles and successes, the tint of their boundaries, the sense of their days and nights. This is supported by the fact that newspapers are still read, news programs are daily watched, news and gossip magazines are found everywhere and it seems everyone has some insight into current events in both a macro and micro level. Rankine incorporates a reporter’s view or a memoirist’s sensibility to achieve her end, whereas Dawson’s approach is far more guttural, embedding itself in the shared sense of feelings within the human experience, the knowing what we don’t know and the suspecting that we share not just something, but everything. It is her structuring and the flowing shift that sifts throughout her manuscript that makes Dawson’s take on the long poem such an effective, compelling and necessary read. be skin born back on every scar and tear. of tides raking the shores. Sister, stand there. “I see the exodus of light. In between the covers, bared to the scorching sun, Dawson has found a way to reveal and to question, to run the earth into bold furrows and flatten it into a crumbly mass ready for more, ready for the reader and the seeding of her work. By the end of it, she opens what must be a beginning to springboard another reading, another session of sweat and sorrow and some kind of joy. 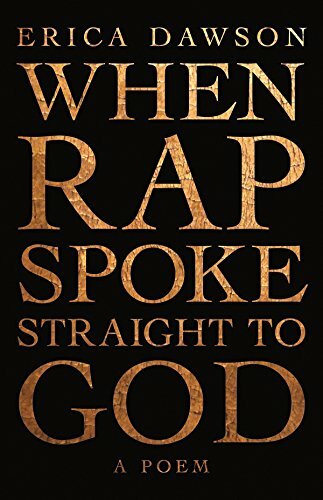 The accomplishment of doing all that in her 46-page poem is what makes When Rap Spoke Straight to God so remarkable an achievement. Poet and novelist Bruce Arlen Wasserman's most recent book is a poetry collection, An Undiscovered Country.